Detoxing, cleansing, and juice fasting usually do the rounds during New Years Resolution time in January, but they often have a resurgence in the spring in the name of ‘spring cleaning’ or getting ready for bathing suit season. Today I’ve got something even more fantastic than a detox, better than a cleanse, and waaaaay more nourishing than a juice fast. What’s that, you ask? The Not-A-Detox plan! First and foremost, because your body is NOT full of toxins! 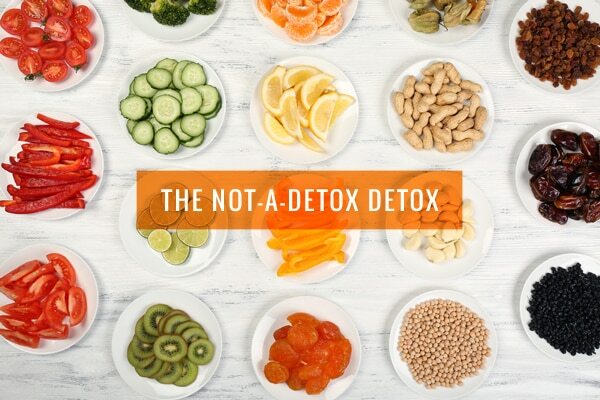 “Detox” is a serious medical term that has been spun into a marketing strategy, all designed to treat a condition of “toxicness” that doesn’t actually exist. Here’s what’s actually happening: on a day-to-day basis our bodies are constantly exposed to a huge variety of both naturally occurring and synthetic substances. Many totally natural substances are incredibly toxic, but luckily the human body comes equipped with an awesome system of defenses and mechanisms to both defend against and remove unwanted substances. Our highly sophisticated detoxification system is comprised of our skin, lymphatic system, gastrointestinal system, kidneys, and liver. Many detox enthusiasts refer to the liver and kidneys as filtration systems where toxins tend to accumulate, and therefore need to be cleaned out from time to time, much like you’d swap out the filter on your water purification system. But that just isn’t how the body works! The liver is self-cleansing – it performs a series of chemical reactions to break down toxic substances into ones that can be eliminated in either bile or urine. And the kidney excretes waste products into our urine. Okay, so if the Not-A-Detox plan is not a detox, what does it involve? Eat in season. Spring is a green glory of newly arrived produce, so eat it up! Spinach, arugula, peas, radishes, carrots, asparagus, artichokes, rhubarb, strawberries, and more awesome spring plants are all in season right now. Get ‘em while they’re here, fresh, and delicious! Fill your plate with plants. Fill it right up. Make at least half of every meal nourishing vegetables and fruits, both cooked and raw, and you’re on your way to feeling great. The old cliché about eating the rainbow holds true here – and it’s the perfect time of year to do it (see the above point about eating in season). Balance with protein. All those greens are grrreat, but we need protein too. In a culture that generally eats far too much protein, you wouldn’t believe how many of my nutrition clients, especially those who are vegetarians, I end up telling to eat more! Protein is not only satiating, but it also moderates the uptake of sugar into our bloodstreams, so eating a high-quality source of protein tends to prevent afternoon blood sugar crashes and the subsequent snacking or uncontrolled eating that goes with it. Aim for plant-based proteins such as organic tempeh and tofu, beans, lentils, and high quality dairy and eggs. Don’t fear fat. We need fat for many essential biological functions, even as simply as absorbing fat-soluble vitamins. Avocado, olives, nuts, seeds, and their oils are great choices for adding healthy fats to your diet. Drink up! The temperatures are rising and we tend to be more active at this time of year, so being hydrated is especially important as we move into the warmer months. There is no magic number for exactly how much you should be drinking – it varies from person to person. But if you’re thirsty, drink water! Keep a water bottle handy at your desk, in your car, on your bike, wherever you go! Listen to your body. Let’s get real – very rarely does my body ask for a plate of nachos (it’s my mouth that does that) but sometimes it’s begging for a big ol’ green salad. So listen to your body, tune in to what it needs to be nourished so you can be the best version of yourself. You may be surprised what you can find out if you take a moment to slow down and really evaluate what you need. Healthy food image via Shutterstock. WOW! Finally someone talking some sense about detox! Thank you. You’re so welcome! Sensible nutrition for the win! Hi Katie. I seem to crave dairy products – butter, cheese, cream. Am I actually craving these things (does my body want them?) or am I just fooling myself and just like the taste? This is a tough question, but the answer is probably a combination of things. Rather than craving those products specifically, your body may be asking for something that they contain. Calcium? Protein? Fat? My usual advice for handling cravings is to replace it with something else – go for a walk, have a cup of tea – and then ask yourself if you truly want what you were craving. If you do, then have some, but do it mindfully. I appreciate the common sense about detox. With regard to protein, I have discovered that while some people do well on a high carb diet, others of us (like me), need a greater amount of protein to feel good and function well. Many years ago I was vegan for a while and ended up having a very vivid dream about eating steak. I did not go for the steak, but did get the message that I wasn’t getting enough protein. If we are eating a diet that does not have an obvious protein source (i.e. meat), it’s worth taking the time to check the nutrition for recipes to make sure we’re getting enough of all the nutrients we need. Definitely everyone’s needs are different! I also find that I benefit from good quality protein sources, and I know I’m not someone who does well without grains in my diet. And yes, an over all nutrient assessment is always a good idea.